Damaged or decayed teeth can cause discomfort, interfere with chewing and speaking, and make you feel self-conscious about your smile. At Demille MacKay Dental, we offer customized dental crowns to restore teeth. With our CEREC® system, we can restore your smile in a single visit. 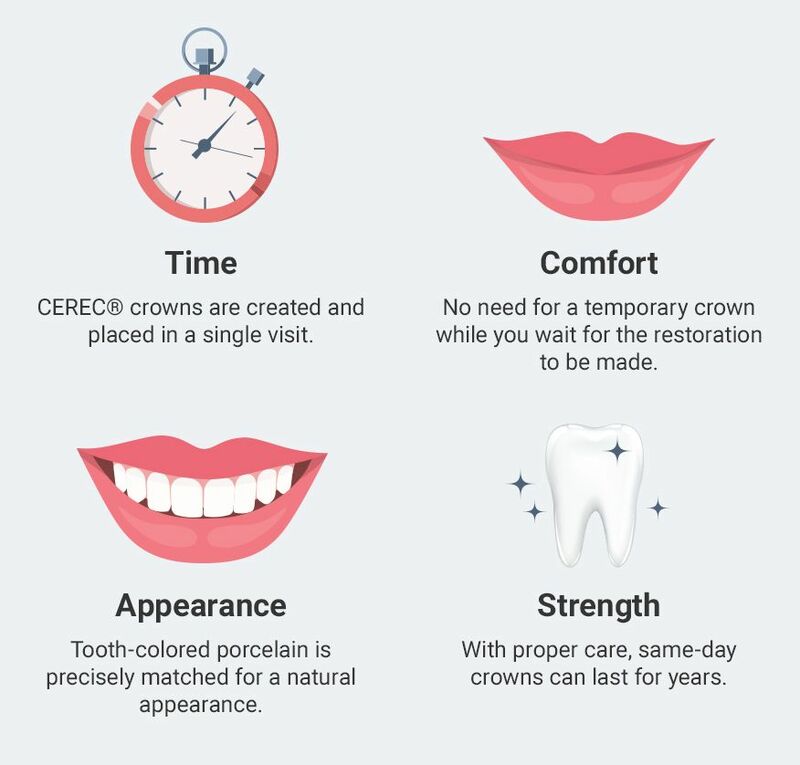 So why should you receive a dental crown? In addition to providing patients with durable all-porcelain crowns, we can design, mill, and place restorations in a single visit. Dr. Christopher DeMille and Dr. David MacKay have invested in CEREC technology, so you can enjoy the convenience of one-visit dental crowns, as well as the natural-looking appearance of custom ceramic restorations. A crown is an indirect dental restoration, which means that it is fabricated outside the mouth, unlike a dental filling. Crowns provide superior strength to fillings, inlays, and onlays, because they protect the entire visible portion of a tooth above the gum line. Crowns are often the restoration of choice for deeply decayed or fractured teeth, or teeth with large, failing dental fillings. Attached to either end of a bridge, crowns can hold a traditional restoration in place. We also use crowns to protect teeth following root canal therapy. In addition, a dental crown may be used as a replacement tooth when attached to a single dental implant. If you have cosmetic concerns, like excessive wear or small teeth, a crown can even improve the appearance of a tooth. Traditionally, crowns are made of all metal, porcelain fused to metal (PFM), zirconia, or all ceramic. For many decades, crowns have been fabricated in a dental lab, outside of the dental office. This process can take two weeks or longer, and the patient has to wear a temporary restoration while waiting for the final crown to arrive from the lab. In some cases, when ceramic will not provide adequate strength on a molar, our doctors still rely on lab-made restorations. Usually, however, our dentists prefer CEREC® restorations for their many benefits. With CEREC® technology, patients do not have to wear a temporary crown or return to our office for placement of a lab-made restoration. CEREC® stands for Chairside Economic Restoration of Esthetic Ceramics. This technology utilizes proprietary software, a digital dental scanner, and an in-office milling unit, as well as durable CEREC® Blocks in various shades of white. To provide a CEREC® dental crown, we first prepare the tooth and scan the treatment area, as well as opposing teeth. The digital scan is entered into the software, and the doctor designs a virtual restoration with precise dimensions for a comfortable, customized fit. A CEREC® Block is then selected in a shade that blends with the patient’s natural tooth enamel. In some cases, patients opt for teeth whitening during the time required to fabricate a CEREC® crown. When this occurs, the doctor selects a CEREC® Block that will match the newly whitened teeth. Our in-office milling unit creates the custom crown and the restoration is placed during the same visit. With CEREC®, patients do not have to wear a temporary crown or return to our office for placement of a lab-made restoration. We are happy to provide this convenient, contemporary technology to our patients. Dental crowns have been used to restore and improve patients' oral health for decades. Contact us today to schedule your appointment with Dr. DeMille or Dr. MacKay and learn whether a crown is right for your needs.